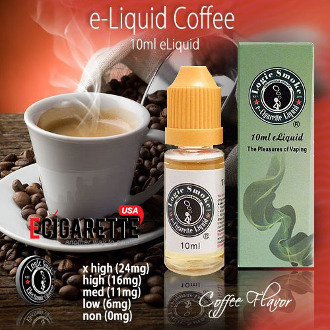 If you are a lover of coffee, then our Coffee electronic cigarette liquid from Logic Smoke should be next on your list. It is as flavorful as a black cup of coffee without the caffeine. And can be mixed with most of our dessert e-liquid flavors such as Caramel, Chocolate and cream. It is a must on any coffee lovers list so pick up a bottle of our Coffee E-Liquid from Logic Smoke today. With the perfect blend of an 80/20 PG/VG mix (propylene glycol and vegetable glycerin: organic, food grade preservative compounds) electronic cigarette liquid, you'll get the best flavor concentration along with the perfect amount of vapor to satisfy your vaping needs. The 10ml bottle is a convenient and economical size for purchasing in quantity. Fill your clearomizer or other electronic cigarette liquid atomizing device directly from the bottle or use it to refill your smaller travel-size e-liquid bottles. You'll be ready and have liquid on-the-go at any time.